It’s funny that whatever my current interest is at the time, the universe gathers related facts and supporting material from the cosmos and sends it my way. Like my seemingly random readings, performance and visual art outings that converged around the theme of burlesque. A few weeks ago I picked up a fairly obscure volume entitled Deep Design: Nine Little Art Histories by Libby Lumpkin, art historian and curator. The chapter on ‘The Showgirl’ made for interesting reading in light of the fact that I had just visited the National Gallery of Art and enjoyed for the umpteenth time Toulouse-Lautrec’s iconic scenes of Moulin Rouge can-can girls. Lumpkin discusses the art historical and historical background of the modern showgirl and her predecessor, the burlesque dancer. I learned that burlesque reached the shores of the United States in 1863 when Lydia Thompson and her British Blondes burst onto the scene providing audiences with ‘a blend of raucous humor and blatant sexuality to which they were unaccustomed.’ Despite the protests and moral outrage, this form of entertainment persisted, eventually morphing into spectacular attractions like the feathered and rhinestoned Ziegfeld Follies. 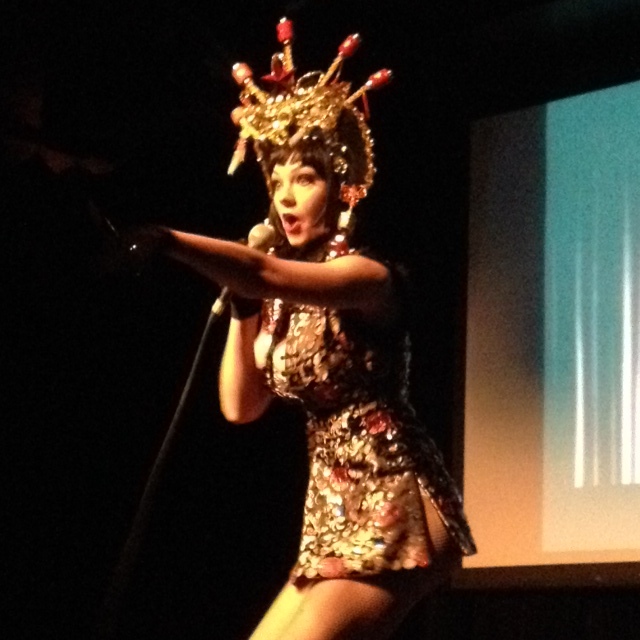 To top it all off, I had coincidentally purchased tickets to a burlesque show – Diary of a Shanghai Showgirl. Not my usual choice of entertainment but the description intrigued me: Two-person variety show follows the true-life story of 23-year-old American, Miss Amelia, as she takes on the Communists to open China’s first burlesque nightclub with her husband, nightclub entrepreneur Norman Gosney, 30 years her senior. Includes eye-opening insights into what it’s really like to live, love, and do business in China, set against the backdrop of forbidden cabaret and nightlife at its naughtiest. I was not in the least disappointed. The show was a welcome diversion and I enjoyed it thoroughly. The multi-talented Miss Amelia has written a book by the same title as the show (the author signing copies below). Lesson learned: Burlesque is not dead. Long live burlesque!